As discussed previously [at length], insulin sensitivity in skeletal muscle follows a circadian pattern: starts out high in the morning and wanes throughout the day. 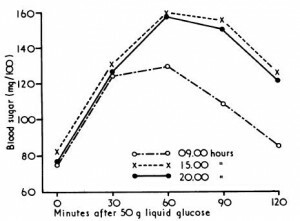 And insulin sensitivity of adipose tissue goes in the opposite direction: starts out low, and increases as the day progresses. 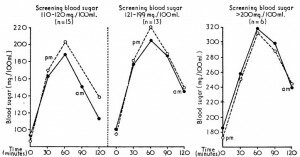 The studies were standardized for a period of fasting, pre-test meal, and exercise… Following insulin, NEFA fell more slowly in the morning (149 uM/15 min) than in the evening (491 uM/15 min). Adipose tissue insulin sensitivity is greater in the evening. FFA are higher, and get shut down more rapidly, after a carb meal in the evening. Summary: to minimize blood glucose excursions and proclivity for fat storage, eat more calories earlier in the day; this is circadian nutrient timing. And according to the Alves study, a low-carb protein-rich dinner best preserves lean tissue during weight loss. Interestingly, the circadian variation of skeletal muscle insulin sensitivity is blunted in patients with insulin resistance and/or obesity. This is known as a “diabetes paradox” in some circles. Many of us have it to a degree, and one study suggested women may fare worse than men. Higher fasting glucose (pre-diabetic) = attenuated diurnal variation in OGTT. ‘Afternoon diabetics’ more likely to become frank diabetics. Collectively, these data suggest that skewing more calories earlier in the day, when insulin sensitivity is high in muscle and low in adipose, bodes better forbody composition and blood glucose control, and this doesn’t work if circadian arrhythmic or insulin resistant. Get some blue blockers … they won’t fix everything, but it’s a start. Skipping breakfast resulted in higher 24-hour average blood glucose levels, by 6 points. That’s not a lot, but this was after only one day… and since skipping breakfast is a circadian mismatch, this likely won’t improve over time. Also, are you surprised? 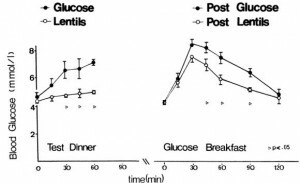 Skeletal muscle is naturally more insulin sensitive in the morning; this is a good time to eat. “The present study under controlled sedentary condition supports the notion that a single late evening meal enhances 24-hour average blood glucose by 4 points.” That’s not a lot, but this was after only one day… and since late night eating is a circadian mismatch, this likely won’t improve over time. Also, are you surprised? Skeletal muscle is naturally more insulin resistant in the evening; not a good time to carb-load. “The rise in plasma glucose after lunch was significantly less if breakfast had been taken, despite comparable insulin responses.” In circadian biology, there’s talk of a food-entrainable oscillator (FEO); kind-of-like the importance of timing of light exposure (LEO), meal timing is also important. Breakfast [in the morning] seems like the optimal time to kickstart the FEO. Collectively, these studies confirm that eating out of sync, when muscle & adipose are less & more insulin sensitive, respectively, results in elevated blood glucose levels. Over time, no bueno. A low glycemic index dinner is similar to a small &/or low carb dinner due to its minimal impact on metabolic homeostasis. Compromise? Have a low net carb, protein-rich dinner. Breakfast skippers had a 27% higher relative risk of coronary heart disease, and late-night eaters had a 55% higher risk… I imagine these numbers are so much higher than the 4-6 point increases in blood glucose because this study was over the course of 16 years; the others, 1 day… also, don’t rip off my head for citing an epidemiological study just yet; rationale is further explained below. Skipping breakfast and late-night carbs cause elevated 24h average blood glucose (Kobayashi, Sato, & Wolever), exaggerated glycemic response to meals (Jovanovic), and are correlated with metabolic deterioration (Cahill). Given the short-term intervention studies and the sound physiological rationale predicted by circadian biology, I suspect there’s a good deal of causation in that there correlation. Optimal: eat more when the tissue-specific circadian regulation of insulin sensitivity is high in muscle and low in adipose = earlier in the day. If circadian mismatched, FIX IT … these biohacks simply won’t work as well in that condition. Nutrient timing > CICO. Period… however, all of this is assuming a a plant-based, low net carb , whole foods template. And a protein-rich breakfast; not typical breakfast food crap. This entry was posted in Advanced nutrition, circadian, clamp, diet, Energy balance, insulin, Ketosis, melatonin, Protein and tagged body composition, calories proper, carbs, circadian rhythm, energy expenditure, insulin, ketosis, melatonin, nutrition, protein. Bookmark the permalink.